Fruit, fruit, fruit, and more fruit! That's what our Blueberry & Pomegranate Superfruit Snack Bars are made of (we didn't even have to add sugar because it naturally comes from the fruit puree and juices). 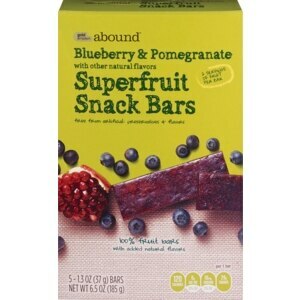 There's nothing but an abundance of sweet deliciousness in these bars in fact, we packed 2 servings of fruit into each scrumptious bar, making these grab-and-go snacks a super choice. Apple Puree Concentrate, Apple & Pear & Grape & Elderberry & Pomegranate & Blueberry & Lemon Juice Concentrates, Citrus Pectin, Natural Flavor, Apple Fiber. Allergy Information: Manufactured In A Plant That Also Processes Peanuts, Tree Nuts, Eggs, Sesame, Soy, Milk.